The Survey Corps' fight against the Titans is nothing compared to humanity's battle against their own history. If you’ve ever wondered what a god sounds like, the characters on Attack on Titan might tell you it’s a thunderous boom inevitably followed by the inimitable sound of ripping human flesh. 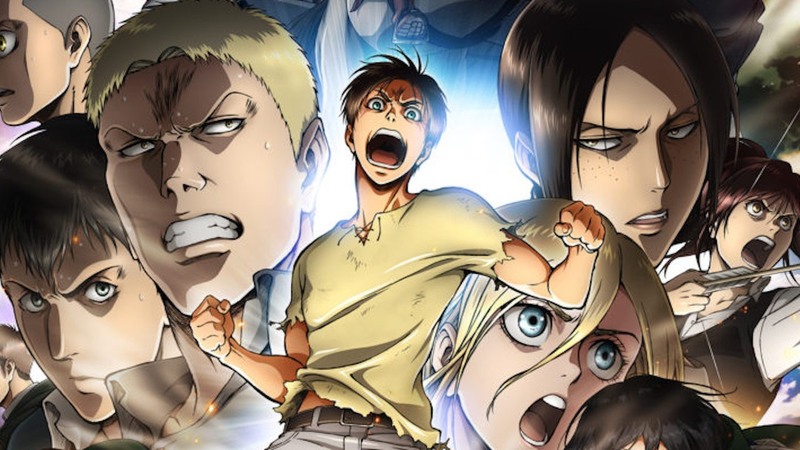 On each episode of Hajime Isayama’s thrilling anime, pounds of shredded connective tissue tear across the screen in slow-mo, leaving very little to the imagination about the ways the body, in terror’s grip, might contort and break under its weight. Long before the Titans penetrate the walls separating their kind from humans, the prospect of their return kept humanity in a quiet, latently anxious state. But once the battle began no semblance of normalcy could be conjured. Though its action sequences are frenetically paced and utterly fun — watching Mikasa downward-spiral slice through the Titans’ toughened exterior never gets old — it’s Attack on Titan’s pressing portrayals of the trauma in the lulls, in daily conversation and minutiae surrounding large-scale fights that make the show at once uniquely binge-averse and painfully magnetic. Modern art in the margins often centers everyday anguish in this way — making humanity and human emotion integral aspects in retelling world histories. Attack on Titan, in the vein of revolutionary political art of the 21st century, is an impassioned, visual harangue on the physical and psychological tolls of war and historical erasure. Aside from its gothic-era setting and the Titans’ existence, the world depicted on the show is not remarkably dissimilar from our own. Underneath the slow unfolding mystery of the Titans, loads of subtext — addressing the dangers of isolationism, religious zealotry, and the psychological aftereffects of war — are packed within the show’s steely dialogue, dramatic animation, and nuanced depictions of military culture. What matters most on the show, however, is its depth of feel — the ways the camera situates itself right on the faces of perpetually terrified people. The violence of the show might, rightfully, be called gratuitous but it’s never a glorification. These characters experience the weight of loss beyond what their words can describe. Those extra seconds spent on their petrified faces, the shock they experience as the mysteries of the Titans are revealed, and the baggage each character carries with them during their service coalesce into a show that challenges the limits of extraordinary humans with unfortunately common afflictions like Post-Traumatic Stress Disorder, feelings of exile, and imposter syndrome within a rigid military context. As fucked up as that erasure — and its rationale — sounds, an institution as impersonal and systematic as the military can hardly stamp out a soldier’s pre-uniform experience completely. The psychological residuals of living in a world that is always on edge are, indeed, written upon these characters hearts and often spring up once they’re eye-to-eye with a Titan. 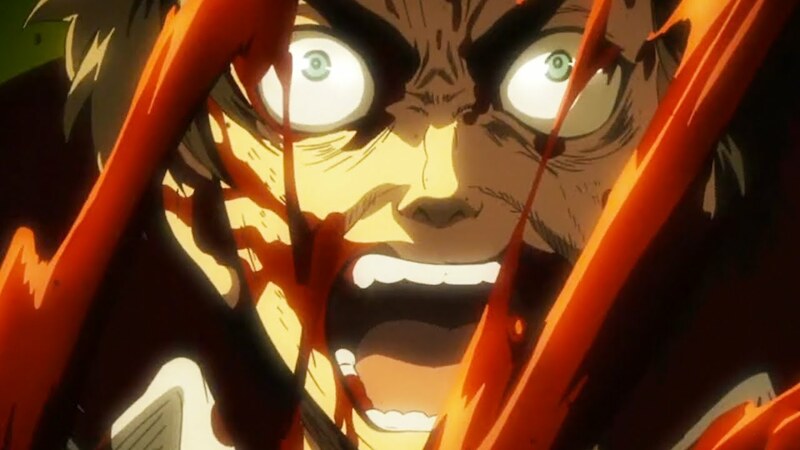 As a main character, Eren is all aboard the Titan-genocide train even after he learns of his own Titan power. His father’s obsession with the beasts coupled with watching his mother get eaten sets Eren on a series long mission to murder every Titan he faces. On episode three, the drill sergeant, rather poignantly doesn’t ask Eren of his past because there is no need — it just so happens to fit within the military’s larger mission. Eren constantly harkens back to the moment his mother was taken from him in order to awaken the necessary strength to accomplish fantastical feats — from carrying a boulder to plug outer walls amidst hungry, stalking Titans to maneuvering around stronger enemies to deal a crushing blow. Eren cruises past a Titan only to be crushed on a rooftop. For side characters, the time spent on their backstories is appropriately shortened but can often be even more tragic. Nanaba’s death in season two is probably the one of the more painful of the series up to that point and we hardly knew her. In the fourth episode of that season, Nanaba exhibits the courage called for by the drill sergeants — and really every vocal commanding officer — hurling herself into battle against a horde of Titans while protecting unarmored recruits atop a crumbling castle on the outskirts of the wall. As she and her colleagues tire and start running low on resources, the situation becomes increasingly clear — a great many of them will die here. A Titan snatches Nanaba out of the air and as it looks directly into her eyes, Nanaba reveals her past living under an abusive father that she’d been keeping under wraps. But in her final hour fear erupts out of her — ”No, no, father please stop! I’m sorry I won’t do it again!” — just before being ripped apart. The scene undoubtedly makes one think about how courage and terror are as adaptable as the humans that hold them — despite our best attempts to colonize the mind by perceivably stronger powers, they morph out of our subconscious to manifest like a waking nightmare. Eren bites his own hand in order to become a Titan. If anything, Attack on Titan is about how to bend and break the human will and no one, it seems, will escape this fate. Eren is genocidal; Mikasa obsessively loyal to Eren; and Armien suffers from imposter syndrome. Every character deals with doubts and that constant negotiation, a fact made normal in the century since the last Titan attack. Before a momentous turn in the second season, Reiner suggests that being a soldier at war is a spiritual battle as much as it’s a physical one — ”It’s like a soldier’s spirit breaks before his body does.” On a larger scale, though, the show seems to be preoccupied with the spirit of history — the story is told as if being read out of a history book no less. The world of Attack on Titan suffers from this same erasure of the past that the military authority encourages. In the season two premiere, a hole in the wall reveals that the multi-story walls, themselves, are made from the skin of Titans —suggesting a murkier, more reciprocal history of the relationship between Titans and humans that went largely undiscovered in the first season. Their past is still unfolding and a reckoning is undoubtedly on the horizon. The slow, unraveling nature of the Titan mystery coupled with the show’s emphasis on how anguish and psychological oppression affects daily life put it in a special class of realist art. In some ways, the show is not about, necessarily, Japanese history or historical protagonists in large-scale war, but the many thousands — within and outside the infantry — who’s broken wills are left outside the scope of history. Attack on Titan inscribes its name on right alongside work like Art Spiegelman’s subtle, engrossing graphic novel, Maus, which works to reassert how a culture of erasure — in this case Nazi culture — dishevels a Jewish family in the aftermath and, subsequently, how oppression reorients our abilities to love. These layered, calcified, emotions were transcribed on the faces of mice on black and white pages, which, inversely, functions to make the story all the more human. The Survey Corps trains in combat. The charge of re-membering a dissected and dispossessed past remains the paramount purpose of the visual artist Kara Walker’s expansive recollection of lynch mobs using 40 ft long walls as canvas. Through her work with huge silhouette cutouts depicting the joy, sexual fantasies, and violence of the antebellum America, Walker posits that despite America’s collection, enslavement, and murder of Black people, the lynch mob was family fun for everyone. Hers is the most clear-eyed take on the ways that a country’s past is painted over in broad strokes by a select few with authoritative and institutional power. But her work is also, for some, the first hole in the wall, the catalyzing moment of recognition of state complicity in genocide, the first bloody knife in an otherwise pristine, white-centric historical understanding of Black enslavement. When it comes to uncovering a history, however fictionalized, Attack on Titan — through its episodic time jumps, visceral images of continuous collective trauma, and suggestions of human complicity in the creation and exile of the Titan race — could very much stand as a reflection of the ways a police-state stifles meaningful social progression. Attack on Titan is a difficult show to watch not because of the gore or brutality but because it’s almost too emotionally resonant. Humans and their respective agendas pose as much a threat to humanity as the Titans do. Viewers from the States to mainland Japan can easily draw out links between attempting to move on from a troubling and violent historical past that does its damndest to always return. Those violent histories, on the show and in our own world are inscribed atop and within the bedrock of human civilization; but once they are uncovered our pasts must be dealt with — either by meeting them eye-to-eye or shielding ourselves from them in willful ignorance. Walls, whether built from concrete or the skin of gods, house some of our deepest anxieties and longstanding secrets but even more, they hinder our abilities to see one another beyond difference. Over two seasons, Attack on Titan’s rising stakes coincide with cracks in the walls beginning to show the darkness in its gaps. More poignant than any action sequencing, Attack on Titan haunts this liminal space between human complicity and deathly fear of difference making it one of the most penetrating pieces of art of our time. Season 2 of Attack on Titan just wrapped on Crunchyroll. There is no set release date for Season 3 beyond 2018.